Choke Republic t-shirts have both bold and subtle designs, that'll have you looking and feeling your best, walking into your next class or competition. In a range of colours, including vintage black and vintage pink, you're sure to find something that helps express your Jiu Jitsu vibe. Whether that's a funny slogan, or a simple logo, Choke Republic offer such variety, you're sure not to be disappointed. 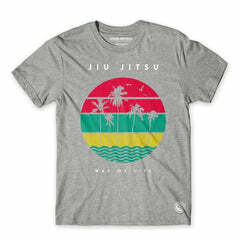 For more Jiu Jitsu t-shirts, see our larger range of BJJ t-shirts.